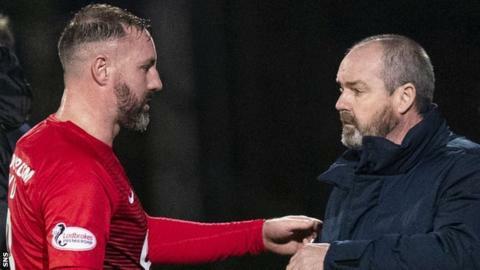 Sectarianism in Scotland is a "sad reflection on us as a society" and "everybody has to take some responsibility" for tackling it, says Kilmarnock manager Steve Clarke. Clarke said he faced abuse from the "dark ages" in his side's 5-0 Scottish Cup replay defeat to Rangers. His striker Kris Boyd said he was subjected to abuse against Celtic. "Things can be done," said Clarke, 55. "Will [it] be done is probably much more difficult to address." "They don't understand what we're talking about up here and that's a sad reflection on us as a society. "Everybody has to take some responsibility and everybody has to try and work together to change. "It won't change overnight but the fact it's back in the headlines, we're back talking about it, is sad in one way but positive in another way. "There's been advances but you still see instances, still occasions when it comes out. "At Kilmarnock, we are all inclusive. There are no divides. That's what we would like for every club in Scotland, for every part of this country but we don't have that at this moment in time." Friday's newspapers quoted Rangers boss Steven Gerrard condemning the abuse Clarke experienced at Ibrox but also questioning why his Kilmarnock counterpart had not addressed the sectarian abuse Boyd received against Celtic. "When I did the press [on Sunday], I didn't know Kris had been hit by a coin and I didn't know there had been chanting against him," Clarke explained. "I spoke [on Wednesday] about the majority having to speak up and shout down the minority, so I think that's addressing it." Clarke also explained sectarianism had played a part in his thoughts about joining Rangers as a player in the 1980s and then as a manager in 2018. "When I was a player - we're going back to 1984, '85, '86 - Rangers didn't sign Catholic players and when I was at St Mirren, there was an inquiry when Graeme Souness took over about me going to Rangers. "I remember the [St Mirren] manager Alex Smith saying 'you couldn't do that, son'," Clarke said. "And it wasn't because there was any racism or any sectarianism from Alex, he was just protecting me as a person. "Not long after, Maurice Johnston went there as the first 'headline Catholic' to sign for Rangers. So, obviously, there have been massive advances. "I mentioned the other night about the approach from Rangers to speak [about the position of manager]. We discussed it because, being from the west coast, I sensed that would be one of the issues. "Rangers assured me they had addressed it and were trying to address it and it wasn't an issue any more but I think what has happened to myself and what happened to Kris, it's still an issue."